The Specific Chiropractic Center has been at this convenient Boston area location since 1997, conveniently located near the Mass Pike exit 17, just 1 mile from Boston. The Specific Chiropractic Center is regarded as one of the most respected offices for Massachusetts Chiropractors and Boston Upper Cervical Chiropractic Care. From the time we opened this clinic, we have committed to helping people out of chronic pain and dis-ease and into a better, healthier lifestyle through Specific Chiropractic care. As a Boston Chiropractor we see many different conditions in our office and provide an outcome oriented, corrective based care. We specialize in Upper Cervical Chiropractic care that has been shown to help patients with neck, headaches and migraines, numbness and tingling, lower back pain, auto accident injuries, whiplash, high blood pressure, M.S. type symptoms, ear infections, ADD and much, much more. Please tour the website to learn about the different conditions we see in our Boston Chiropractic office, see the awards we have received over the years and read our reviews about the great success we have had with our patients as chiropractors in the Massachusetts area. We have won the Best Chiropractor award 14 years in a row in our Watertown MA clinic and work hard to maintain this great achievement. Our deep understanding and intense interest have allowed us to have tremendous success with accident-related and neurological health conditions, as well as providing welcome relief to pregnant women and children. 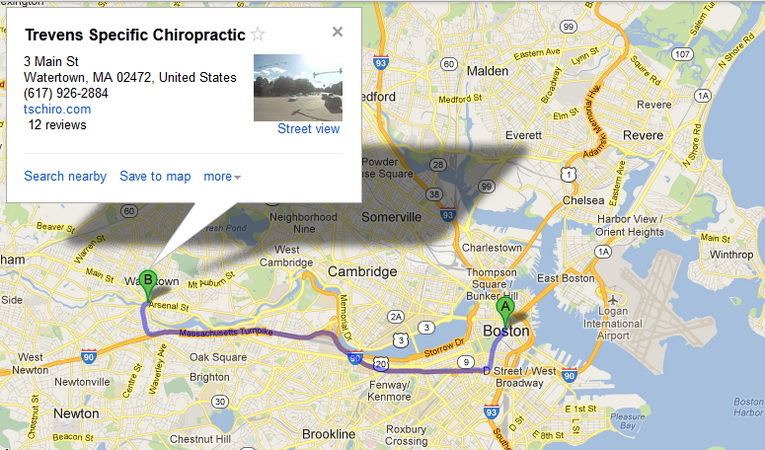 If you are looking for a great Boston Chiropractic experience we urge you to contact us!